cute little life: Oh, how we love Mr. Collins. Oh, how we love Mr. Collins. "What a superbly featured room and what excellent boiled potatoes. Many years since I've had such an exemplary vegetable." "... Which is my primary object of the evening... 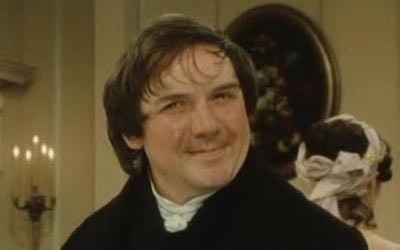 It is my intention - if I may be so bold - to remain close to you throughout the evening..."
"Mrs. Bennett, I was hoping, if it would not trouble you, that I might solicit a private audience with Miss Elizabeth in the course of the morning." "And now, nothing remains but for me to assure you in the most animated of language of the violence of my affections." Hah!!! When I read these on google reader, the pictures didn't show up. Is it possible for any man to be more awkward/creepy than Mr Collins? ?